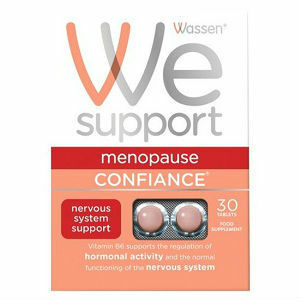 Confiance is a unique one-a-day nutritional supplement especially for women during the menopause and beyond. It contains a balanced combination of four important minerals, ten vitamins and citrus bioflavonoids. Vitamins B1, B2, B3, B5, B6, B12, biotin and magnesium all contribute to the normal functioning of the nervous system, while vitamin B6 supports the regulation of hormonal activity. Vitamins B2, B3, B5, B6, B12, folic acid and the mineral magnesium all play a role in the reduction of tiredness and fatigue. Citrus Bioflavonoids – 15 mg.
1 tablet per day to be swallowed with liquid after food. $18.02 for a 90 day supply. Note that on the website the price was quoted in British pounds and the U.S. was not on the list of countries this product is shipped to. No information about product guarantees was provided in the product source. A phone contact number in the United Kingdom (U.K.) was provided. While this product is not expensive anyone in the U.S. thinking of buying this product should considering contacting the vendor in the U.K.to see if this product is sold or shipped to the U.S and also to ask about company guarantees and return/refund policies. Jackie Horowitz	reviewed We Support Confiance	on September 16th	 and gave it a rating of 2.